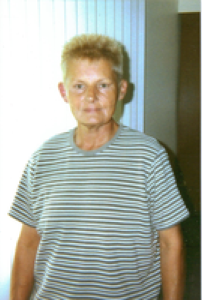 Doreen D. Doseck, 57, 3433 Georgian Ave., Apt. J, Lima, Ohio died at the Lost Creek Care Center, Lima, Ohion on Saturday, September 12, 2009 at 4:40 am. She was born August 5, 1952 in Sidney, Ohio to Howard C. and Janice L. Doseck. They are deceased. She is survived by 11 brothers and sisters, Jack Doseck, Tipp City, Ohio, Peter Doseck of Sidney, Ohio, Charles and Jim Doseck of Troy, Ohio, Paul Doseck of Englewood, Ohio, Scott Doseck of Bellefontaine, Ohio, Lori Albright of Troy, Ohio, Lisa Rosenbaum of Cincinnati, Ohio, Gary Doseck of Bellefontaine, Ohio, Heather Doseck of Marysville, Ohio and Angie Brown of Cincinnati, Ohio. Doreen is also survived by 15 nieces and nephews and 28 grand nieces and nephews. A sister, Gay Doseck and a brother, Henry Doseck preceded her in death. Doreen had been a member of the Moose Lodge in Lima, Ohio. Doreen was employed as the first woman assembly person at General Dynamics Tank Plant in Lima, Ohio. She held the honor of also being the first woman to directly have a hand at assembly a tank. A life&#39;s celebration will be held on Tuesday, September 22, 2009 from 5-9 PM at the Heart Hall, 1658 W. Breese Rd., Lima, Ohio.